Alligators are not the only crocodilians at Gator Country. This dwarf caiman is one of several varieties available for the public to see. No animal symbolizes the marshes of coastal Texas better than the American alligator. 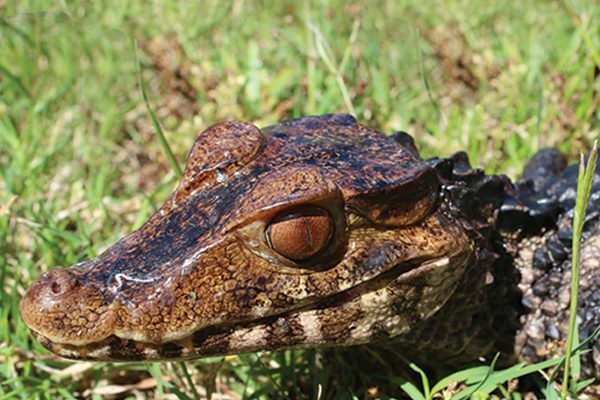 Once an endangered species, the population rose enough to open a hunting season in 1984 and now thanks to solid management by the Texas Parks & Wildlife Department and private landowners, the alligator is doing wonderfully in the Lone Star State. In fact, with increasing development and economic activity in region, alligators and humans are having more encounters than ever. Sometimes they find themselves in locations that pose a danger to themselves as well as people and that is where Gary Saurage comes in. 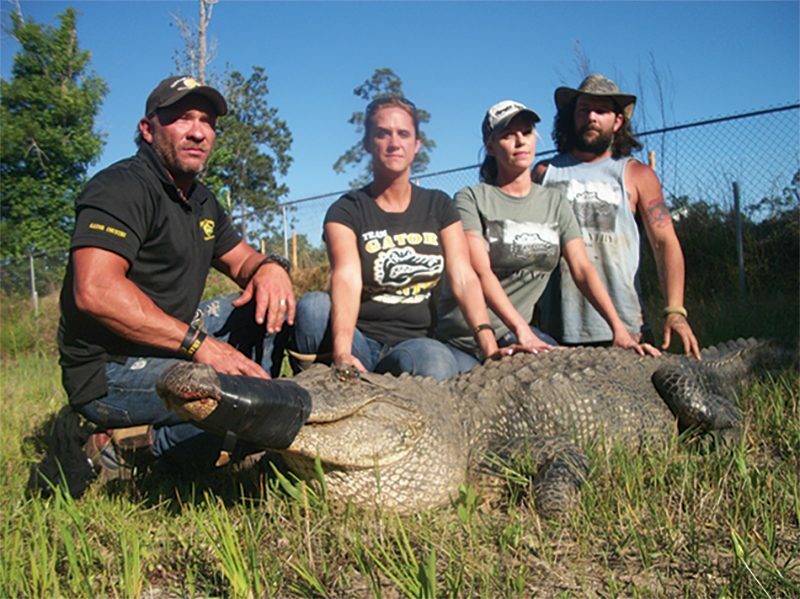 Saurage, owner of Gator Country in Beaumont, is one of several nuisance alligator control officers in the state and often gets the call when an unwelcome gator shows up. Back in May, I accompanied their crew on an alligator rescue at the Sunoco Plant in Nederland. It was amazing to watch them meticulously pursue the 10 foot, 8-inch alligator and bring it in alive. Pictured here are Gary and Janna Saurage and Arlie and Jessica Hammonds with that gator. “We bring our team in and capture the gators and bring them back to Gator Country to be released alive. These nuisance gators can’t be released back into the wild so we put them in with our gators at the park to teach people about these amazing creatures,” Saurage said. “Alligators are part of the natural order and are key to healthy wetlands. It can be really easy for the public to get a negative opinion of alligators because if you don’t understand them they look scary and sometimes get a bad rap. That is one reason I remain so passionate about the work we are doing with Gator Country and our Gator Rescue. We get to reach so many people with a true look at these amazing creatures,” he said.